The first Europeans arrived in Japan by accident in 1542, when a Portuguese ship trying to reach China was blown ashore in a storm. Its fairly safe to imagine that during the Azuchimomoyama period (1563-1598), when the country was regularly visited by European traders, that the knitted stockings and clothes worn by these visitors, some of whom even settled in Japan, would have been seen by their Japanese hosts, but there is no evidence one way or the other of the technique having been passed on. The Azuchimomoyama period gave way to the Edo period (1603-1867) .During the Edo period, Japan deliberately isolated itself from the outside world, allowing Japans own particular culture to blossom and develop, but preventing a more rapid assimilation of outside influences. Nevertheless, a small amount of trade with the Dutch (and Chinese) was allowed to carry on via Nagasaki, bringing in stockings, gloves and clothes, and  quite prossibly  the techniques of knitting as well. Linguistic evidence suggests that familiarity with these techniques occurred in the early years of the period. The derivation of the word Meriyasu, still used today to mean a piece of knitting made using stocking stitch, was already in use at the outset of the Edo period. It is thought to derive either from the Spanish word for stocking stitches, Medias or the Portuguese word Meias. 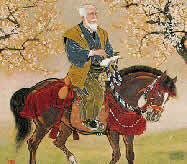 The words can be found in Haiku from this time, and it is speculated that Nagasaki prositutes, familiar no doubt with Western male clothing, either possessed knitted stockings or learnt the technique of knitting from their clients. The oldest surviving examples of knitting used but probably not made in Japan stem from the relatively early years of the Edo period. Seven knitted stockings, 3 made from silk and 4 from cotton, are on display at the Suifumyotokukai Syokokan museum, in Mito City. These were the personal clothing of Mitokomon-Mitukuni Tokugawa (1628-1700), grandson of Ieyasu Tokugawa  the first Shogun of Japan. Other socks, gloves and a knitted Katana (a bag to cover the hilt of a sword) are also in museum collections. & the start of Samurai Knitting! surely we are joking? Well no, were not. 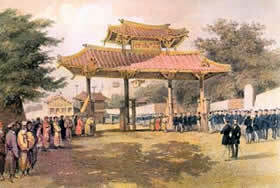 The end of Japans long isolation was signalled by the arrival in 1853 of an American naval officer, called Mathew C. Perry. Perry carried with him a letter from the President of the United States asking for access to the country, and the following year Japan signed the Agreements for Friendly Relations between the US and Japan. 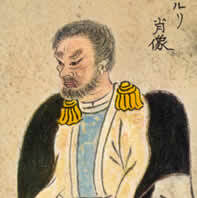 Even although the Edo period would last until 1867, radical social changes were already taking place, principally within military organisational structures and government. The influence of the samurai class, who had helped enforce the rule of the Shoguns, was now waning, and the army was being reorganised along Western lines. As a result there was a demand for knitted gloves and socks, amongst other items of military apparel. Unlikely as it may seem, some of this demand was met by the Samurai themselves, who supplemented their diminishing income as warriors by knitting Tabi, a Japanese style of sock. Tabi socks, with their split toes, had long been worn by samurai, Shinto priests and Kabuki artists because of the added flexibility of movement they provided. A reproduction of an illustration showing a samurai warrior doing knitting can be seen at the Sock Museum at Sakata, - its true, the samurai really did do knitting! Id love to be able to tell you more about Samurai Knitting, but it seems to be a subject that even Japanese people are barely aware of. We do know the names of some of the more distinguished knitters. The Samurai clans which knitted most actively were the Nanbumatumae-han, Hitotubashi-ke, Tayasu-ke and Hitachitatugasaki-han clans. A Samurai knitter called Mr.Terufusa Orihara from Hitotubashi-ke was famed for his skilled knitting of of Meriyasu (Stocking stitch).